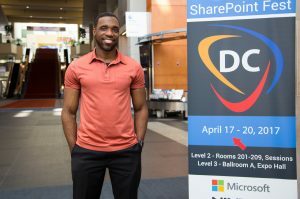 I had a great time at SharePoint Fest DC 2017! cFocus Software was a Platinum Sponsor at SharePoint Fest DC 2017 for the second straight year. As usual, it was a very highly populated event with over 600 registered attendees! We unveiled our new booth for the first time, and I was very happy with the way it looked! More importantly, we met quite a few people, and had good engagement with folks who stopped by to learn about who we are and what we do. It was also great to see fellow presenters, SharePoint evangelists, and administrators who we always seem to see at these SharePoint events! I made a session presentation at the event entitled, “Office 365 Advanced Security Hardening with cFocus Software”. In my session, I provided an overview of Office 365 security, and subsequently made recommendations for hardening Office 365 security. I also did live demonstrations of cFocus’ Office 365 environment, giving specific details about how we implemented the security recommendations in our own Office 365 tenant. The information was well received. I thank all of the good folks at SharePoint Fest DC, and everyone who attended my session. It was my distinct pleasure to participate!